Butterfly Effect’s aspiration is to trigger unexpected results in the atmosphere and hearts, of each city where we flap our wings. In a world where it’s easy to get distracted by the negative images and stories being constantly harpooned in every direction, we hope to bring positive change with every Drop. 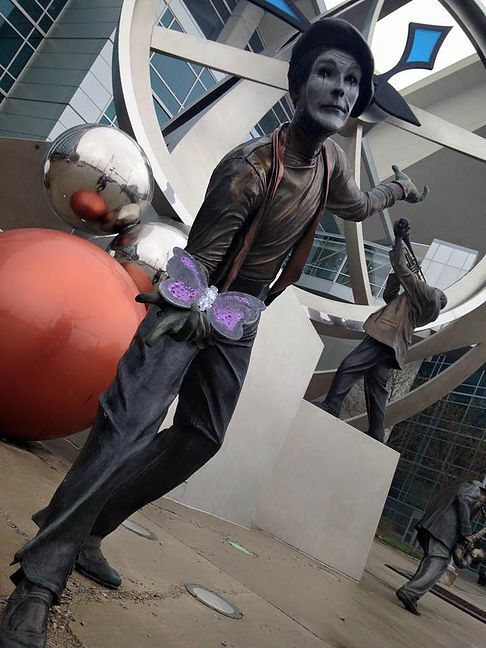 Each butterfly drop has a story that connects people all over the world in ways they could have never expected. From the artist who creates the butterfly, to the person who gets to create and post the drop. 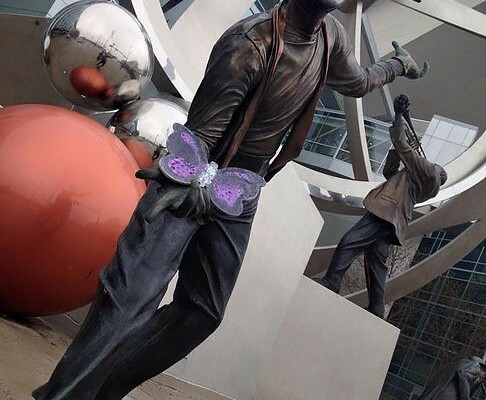 From the city where it gets dropped and the social media community that gets the buzz going, to the person who ultimately finds the butterfly. From the charity receiving the funds, to the beneficiaries of those funds. You can practically hear the flapping of little wings as the molecules of change are cast across the globe. Encountering the unexpected can be scary and something people try and avoid, but as this project has evolved the unexpected is exactly where the magic has been found. We’ve also discovered that listening to that nagging feeling you just can’t shake will often be the molecules of change that spin an amazingly unexpected experience into motion. Recently I was in a city on business, wrapping up the day to head to the airport focused on the next life event. As I swirled through the motions I had no intention of dropping a butterfly in that location, time was slipping away. But as the minutes ticked by I couldn’t ignore the feeling that I needed to make drop. Quickly grabbing one of two butterflies that I had brought with me, I scouted a location near by, dropped and fled to the airport. While waiting to board the flight I received a series of Tweets that took my breath away. 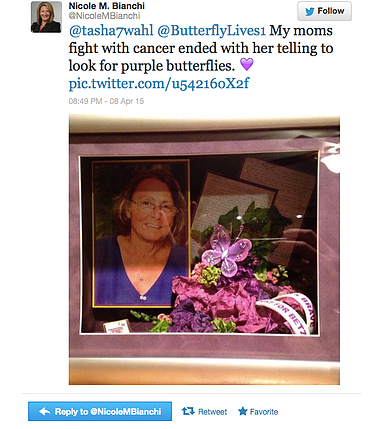 Nicole Bianchi had been looking for purple butterflies since her mother passed away from cancer in October. 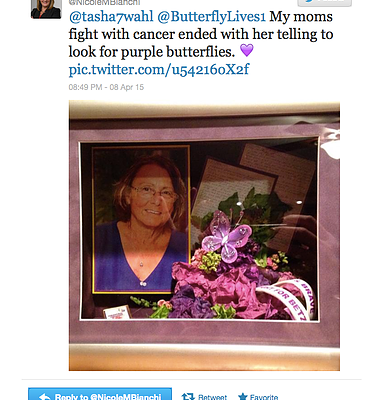 Nicole wrote, “One of our last courageous conversations she told me soon her journey would be ending. As we held hands and I cried she told me she would always be with me. I asked her how I would know that. She paused and said to look for purple butterflies. 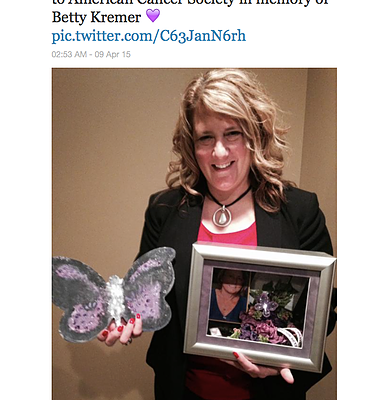 She passed on October 22, 2014, and this is the first purple butterfly I have seen, and this was a powerful one. On a day where my business was recognized for the work we are doing with ICAN, she was letting me know she was there cheering me on. My heart was bursting and such a wave of peace settled over me. I know she is with me. Thank you from the bottom of my heart”. 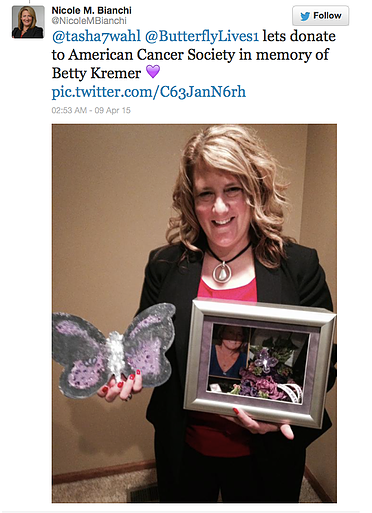 I know as the details of Betty Kremer’s battle with cancer have unfolded that what seems like a coincidence, is not one at all. We are all connected even if the ribbons of those connections are a mystery. It’s exciting to see how responding to the idea that “we can and mustBe the Change we want to see in the world, has indeed launched the molecules in motion that are making a positive difference and touching lives around the globe. Thank You, Nicole for Being The Change!